The classy ring has a rounded top and is a gradual and subtle dome shape on top. 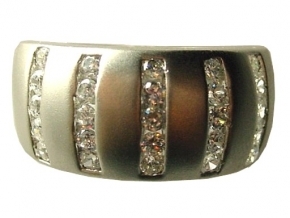 It is 3/8" wide in front and goes down to just under a quarter-inch in the back of the finger for comfortable wear. 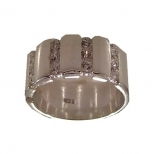 It has a brushed silver finish and the design is made up of 5 recessed-set rows of round stones. Each row has 5 six-point stones, for a total of 1.5 carats total. The stones are set into sterling silver, sealed in platinum so that it will not tarnish like regular sterling. This is a gorgeous ring with a unique look. Please note that although our drop down sizing window shows sizes 9 thru 13 for our men's rings that in most cases we only stock size 9 - 11 for immediate shipping. Other sizes shown could take a week or two to mail out, while we make it up for you. 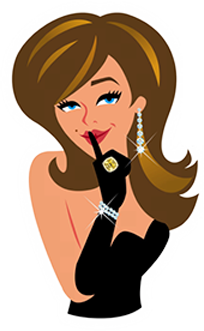 We will email you within 24 hours to let you know how fast your item will be shipping out, or feel free to call or email us with the exact name of your ring and the size you need so that we can tell you if it is currently on hand for immediate shipping, or give you an approximate shipping time estimate if it has to be made.